Where does one begin this story? At the very beginning, when the universe had exploded into being with a bang, with matter and radiation being created, or at a time when stars began to shine? Telling both stories would make this article too long and so I will confine myself to an account of stellar nucleo-synthesis. 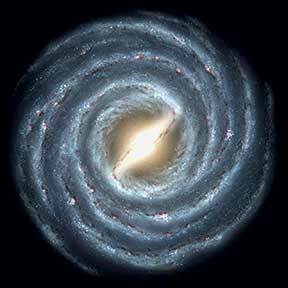 We assume a period of time when matter and radiation have been created and when the universe has expanded and cooled to a point when gravity has created clumps of matter which are the planets, stars, galaxies, clusters of galaxies and so on. When one looks into the night sky, one observes light from the stars. When people in the 18th century began to record this light by using photographic film, our ability to understand the processes which took place inside stars and galaxies became better since one could now easily get more intense images due to longer exposure times. Among the most basic ways in which this light can be analyzed is to see how much intensity there is in each colour. To do this, one needs to split the light up using prisms, gratings and filters to create a spectrum. A spectrum of say, the light from the sun or a star, is essentially a record of what colours are present in that light. It does not have to be confined to the visible region of the electromagnetic spectrum but can and does include other ranges like the radio, microwave, infra red, UV and X-rays. When elements and ions emit or absorb light, they do so only at certain wavelengths. Further analysis shows that each element has a unique signature, i.e., the set of wavelengths at which a particular element emits or absorbs light is specific to that element and no two elements have the same signature. Another way of putting it is that the spacing between the lines of a spectrum of any element is unique to that element and characteristic to it. Such spectral analysis shows that the Universe is made from the same stuff as we are, and stellar structures are not unlike that of the Earth itself. An interesting historical fact is that helium was first discovered on the sun. Unknown spectral lines discovered in the solar spectrum, produced by an element initially nicknamed “coronium”, were finally identified with that of helium which was discovered subsequently on the Earth. The picture below shows the spectrum of the sun with absorption lines (called Fraunhofer lines named after the German physicist Joseph von Fraunhofer (1787–1826) who observed them in 1814 and systematically mapped over 570 lines. Modern observations of sunlight can detect many thousands of lines). The author currently teaches science and physics at Centre for Learning, Bengaluru. He has a PhD from IUCAA in the field of semi-classical quantum gravity. His other interests include design and technology, electronics and reading. He can be reached at ksrini69@gmail.com.